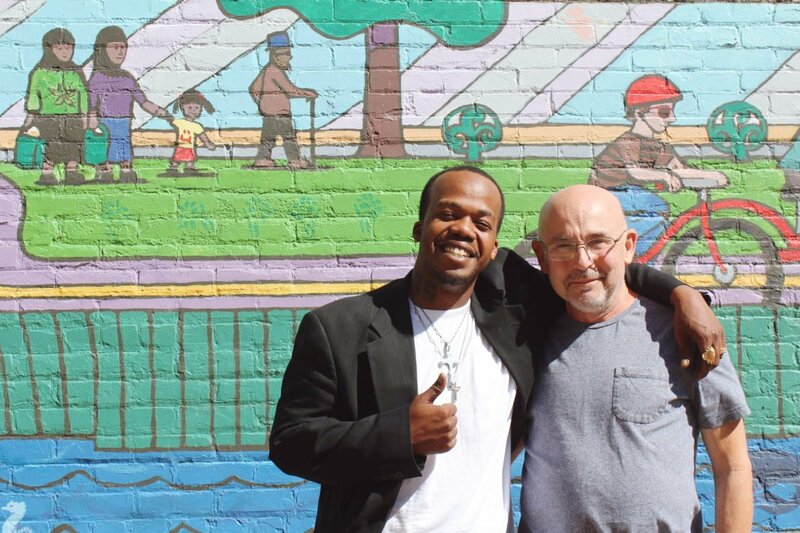 Sircleveeo Adams (left) and Kip Hedges (right) are just two of many workers and organizers bringing the fight for a $15 minimum wage to St. Paul. Photo by Cristeta Boarini. Samuel Callahan is a single father raising his 14-year-old daughter, the youngest of his seven children. The father-daughter pair share a one-bedroom apartment in North Minneapolis. It’s cramped quarters, and yet the small family still does not get to spend enough time together. Callahan has been working at a Taco Bell for the past four years, but in 2016 he also started picking up shifts at a McDonald’s in order to make ends meet. In total, Callahan works 17 hours a day, six days per week. He has never missed a day of work, often working through weekends and some holidays. When his daughter, a track and field athlete, comes home from school, Callahan is just starting his second shift. He has never been able to attend her track meets. “[My daughter] understands, I’ve got to work. But I want her to be able to have it better. I don’t want her to struggle the way I have,” Callahan said. For all Callahan’s hard work, he only makes $10 per hour. His take-home pay is just enough to make rent and some of the other basics he and his daughter need, but leaves no margin for savings or an emergency. As Callahan puts it, his kind of work doesn’t really make a living. On June 30, 2017, the Minneapolis City Council passed a landmark ordinance that brings a $15 minimum wage to all people working within city limits by 2024. While Callahan’s Northside neighbors will start seeing annual increases to the minimum wage starting Jan. 1, 2018, Callahan has to wait. Both of Callahan’s jobs are located in St. Paul. But hopefully, Callahan will not have to wait long. In St. Paul, the fight for $15 is just starting to heat up. With the win in Minneapolis under their belts, workers and organizers are building off that momentum to bring higher wages to Minnesota’s capital. 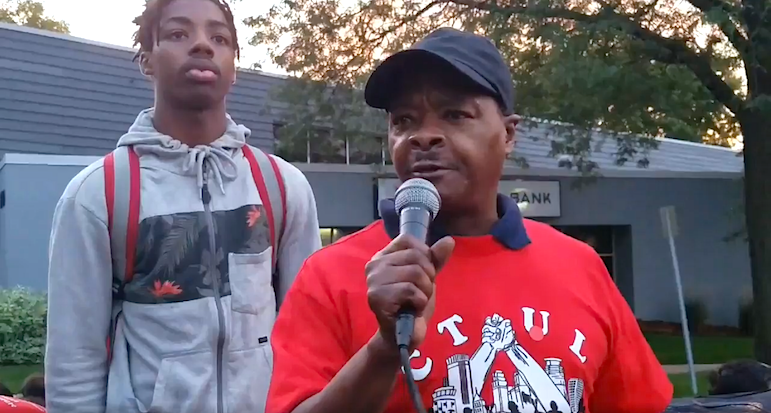 The fight for $15 in St. Paul kicked off at dawn on Labor Day, Sept. 4, as more than 50 St. Paul fast food workers – including Callahan – went on strike to protest low wages and intimidation from management. It was the first time Callahan had missed work at either of his two current jobs. While St. Paul’s movement may be new, the force behind it has been growing in the Twin Cities for years. Standing beside Callahan and his fellow striking workers were organizations and unions like Centro de Trabajadores Unidos en Lucha (CTUL), 15 Now, Black Lives Matter, Service Employees International Union, ISAIAH as well as some new St. Paul-based partners like Ujamaa Place. Together, the groups make up a familiar coalition that not only won the $15 minimum wage fight in Minneapolis, but also brought the passage of earned sick and safe time ordinances for both Minneapolis and St. Paul in 2016. Samuel Callahan speaks at a Sept. 4 Labor Day strike in St. Paul. Photo courtesy of CTUL. For Kip Hedges, a former Delta Airlines baggage carrier now serving as an organizer with 15 Now, the winning streak doesn’t mean that the fight for $15 in St. Paul will be a cakewalk. But the stage is set for ambitious goals. The coalition wants to see passage of a new minimum wage ordinance in St. Paul – without a tip penalty nor a youth wage cutout – by March 2018, with an implementation schedule similar to that passed in Minneapolis. One of the steps to get that something done will be to get St. Paul to conduct a citywide study to understand the impact of increased wages, pointed out CTUL’s co-director Veronica Mendez Moore. While St. Paul and Minneapolis share many similarities, politically the Twin Cities each have their own flavor. That means when it comes to building a movement, talking to residents and lobbying elected officials, the messaging and tactics can vary even between communities with so much in common. One factor that will remain the same between the Minneapolis and St. Paul fights is the influence of the business community, especially organizations like the Minnesota Restaurant Association, Mendez Moore said. With a 13-member City Council dominated by the DFL, Minneapolis has one of the most liberal municipal governments in the nation, according to a 2014 study by the Economist. Conversely, St. Paul’s smaller, seven-member City Council skews slightly more conservative. But it was Minneapolis’ larger council, and the need for a seven-member majority, that slowed progress, in part, for the $15 movement for nearly a year. The need for a smaller City Council majority in St. Paul and the growing political will for $15 in the city could mean a faster track for passing a wage increase. Six of St. Paul’s mayoral candidates – Melvin Carter, Elizabeth Dickinson, Tom Goldstein, Pat Harris, Tim Holden and Dai Thao – endorse a $15 minimum wage. In addition, Hedges and Stark noted that St. Paul’s charter – the document that establishes the creation of a municipality – allows for a wider variety of policies to be made via referendum than Minneapolis’ city charter. That means if the fight for $15 coalition wanted to raise St. Paul’s minimum wage via a ballot measure, it has a greater likelihood of getting on the ballot rather than getting caught in a state Supreme Court battle like in Minneapolis. All summer, 15 Now and other organizations have shown up at St. Paul community events to begin getting the word out about the movement. From the Selby Avenue JazzFest to the Wilder Block Party, Hedges said that a good portion of the people he spoke to were familiar with the fight for $15. But at the same time, there were many misconceptions. Some folks thought the passage in Minneapolis meant that it also applied to St. Paul, or that the minimum wage would jump to $15 right away rather than incrementally over the next five to seven years. The misconceptions helped Hedges understand what education still needs to be done. But through conversations, once St. Paul workers learned what the $15 movement is about and how it can help them, Hedges said that everyone he spoke to has been on board, workers like Sircleveeo Adams. Adams is a long-time St. Paul resident and worker with four children. For most of his life, Adams said he has had to work two or three jobs to take care of himself and his family – sometimes having to drive nearly four hours out to Marshall, Minnesota, to find a decent paying job. Over the recent Labor Day weekend, Adams – who is active in the movement for Black Lives and community events like Rondo Days – attended his first rally for the fight for $15. “If everyone had $15, it’d be more relaxed. When you can’t pay your rent, can’t afford transportation, it builds tension, you get sick. It’s all connected,” Adams said. St. Paul proportionately has more residents living in poverty than Minneapolis – most of whom are residents of color. In addition, more than 20 percent of St. Paul’s workers earn less than $15,000 annually. And as Hedges pointed out, the fight for $15 is as much a fight for affordable housing as it is wages. But perhaps the most telling indicator of how the minimum wage fight might play out in St. Paul would be to look back at the struggle for another workers’ rights issue: earned sick and safe time. St. Paul passed its earned sick and safe time ordinance on Sept. 7, 2016, while Minneapolis passed a similar ordinance nearly four months earlier on May 26, 2016. Despite the time difference, both cities scheduled implementation of the policy to begin on the same day: July 1, 2017. In Minneapolis, the conversation around earned sick and safe time began publicly in April 2015, when Mayor Betsy Hodges first introduced the Working Families Agenda – giving the city nearly a year to do research, community engagement and debate on the issue before the ordinance passed. St. Paul’s earned sick and safe time ordinance took only seven months. During the earned sick and safe time debate, council members Thao and Stark both stated that they felt the shorter timeline between initiating a study and passing the ordinance was too fast. For the minimum wage debate, both council members mentioned wanting to have more time to educate residents and business owners, while also making the process more accessible. Mendez Moore agreed, noting that if St. Paul wanted to better help business owners and employees prepare for new ordinances, there could be better support structure provided by the city. For earned sick and safe time, Mendez Moore said workers have reported to CTUL a lack of education and implementation of the new policy in both cities. In addition, Mendez Moore pointed out that if a minimum wage ordinance in St. Paul had a similar implementation schedule as Minneapolis, that would be a great benefit to workers and businesses in both cities. “There are a lot of people who live in one city and work in the other,” Mendez Moore said. “It just goes to show that this needs to happen quickly. Energized by the movement’s momentum, Adams has started organizing with 15 Now. For him, this work means tangible results. And no talk whatsoever about workforce training. Once the 15 is put in place and business reacts with automation and less need for low skill workers we will have a bigger problem than they think they have now. Throw money at a problem the wrong way you will continue to have more problems,. That’s exactly what is happening here. Look for self serve checkout, automated cooking (like is being done elsewhere) and you are going to see a large leap in automation by business leaving low skill workers screwed. How about throwing some money at training and have folks NOT NEED to rely on low skill low wage jobs, just as thought. The problem David is that you can’t get people on the right side of the political spectrum to “throw money” at ANYTHING! Whether it’s training or minimum wage or sick pay, etc, they don’t believe in telling businesses what to do, no matter what the case! MANY big ups Samuel Callahan. Taking that story at face value you sound like the type of person that really inspires me. That level of dedication-17 hours a day, fin exchange for less than $200 a day you could have been spending with your daughter is heartbreaking but bittersweet to me as it literally energizes me to work harder in the search for new ways and new connections to push us ahead (not ju st around). Speaking of new ways, I do question some of the statements the author makes referencing the general situation and would love to bounce ideas around in a friendly if challenging way. Samuel Callahan, if you happen to read this comment I’d like to bounce a few of these ideas your way. On Jan. 28, 2019, St.